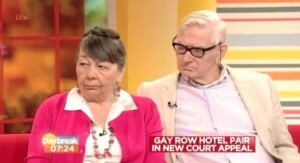 LONDON — The five justices of the British Supreme Court have ruled against the Christian owners of a UK bed and breakfast for declining to allow two men to sleep together because they are homosexual. As previously reported, Peter and Hazelmary Bull have placed the Chymorvah Hotel on the market as they state that circumstances have devastated their business and lives. The situation occurred in 2008, when Martyn Hall and Steven Preddy reserved a double room, but was turned away by the manager when he discovered they were homosexuals. Chymorvah Hotel does not allow unmarried couples–homosexual or heterosexual–to share a room. After losing in appeals court, they appealed the case to the Supreme Court in hopes of having the ruling overturned and the order to pay damages annulled. However, on Wednesday, the court sided with Hall and Preddy, stating that because the men were in a civil partnership, they should have had the same–or similar–protections as if they were married. However, the Bulls expressed disappointment over the ruling, stating that they found it ironic that while homosexuals are protected by the courts, Christians are discriminated against and treated as second-class citizens. Similar rulings are occurring in the United States as a number of florists, bakers, hotel owners and photographers have been declared guilty of discrimination for operating their business in accordance with their Christian values.